Renowned for its excellent customer service, Deer Valley in Utah scoops the 2013 OnTheSnow Visitors' Choice Award for Best Family Resort in the Rockies. Families are drawn to its perfectly groomed, uncrowded slopes and convenient amenities including on-site childcare, ski valets and free parking-lot shuttles. Deer Valley has more grooming equipment than any other Wasatch ski area and takes great pride in its impeccable runs. The resort has also gone to great lengths to keep its slopes uncrowded; as of 2006, the resort limited ticket sales to 7,500 per day. It is also one of the three remaining American ski resorts that prohibit snowboarders. Deer Valley's 2,026 acres and 100 runs benefit from an average annual snowfall of 300 inches, offering great conditions for all abilities. SKIING FOR THE KIDS: Bald Eagle Mountain is home to the Wide West, a protected beginners' area ideal for first-timers, accessed by the Burns and Snowflake chairs. The ski school uses dedicated ski school slopes on which to gain confidence, and the low student-to-instructor ratio means Kids come in leaps and bounds. There's also teen group lessons for the older ones. Be sure to download or pick up a Children's Adventure Map for fun winter activities on the mountain. OFF-HILL ACTIVITIES FOR MOM & DAD: Browse the resort-owned and operated boutique stores in the Snow Park and Silver Lake Lodges. For a night out, start with cocktails at the EBS Lounge in the Snow Park Lodge. Then sample the award-winning cuisine at one of the best restaurants in town: Mariposa, in Silver Lake Lodge, which has been rated the #1 restaurant in Utah by the Zagat Restaurant Guide and offers a winning blend of classic and contemporary cuisine. For a wider choice of nightlife, Park City's Main Street is only a mile away with more than 100 restaurants and bars. 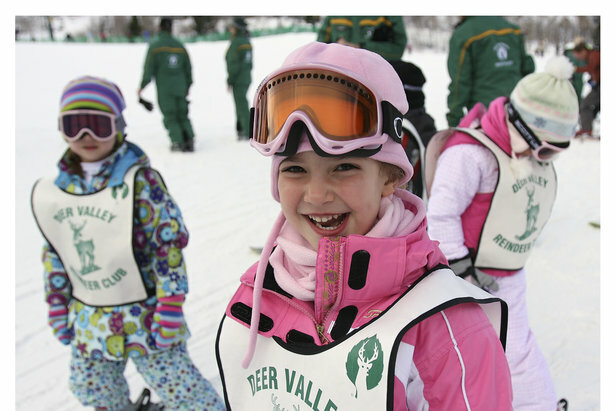 FAMILY FUN OFF THE SLOPES: The Deer Valley Children's Center is a state-licensed facility providing supervision and activities for non-skiing children ages 2 months to 12 years. Activities include storytelling, art projects and singing. Other popular off-mountain activiites include dog sledding, sleigh rides, snowmobiling and hot-air ballooning.